Rex Materials has developed a family of crack repair and patch moldables for every application, Pyroform E-Z Fill™, Pyroform E-Z Fill HD™, Pyroform E-Z Fill Extender™. Whether repairing a small crack or a large section of material, Rex Materials has the right moldable for you. Pyroform E-Z Fill is Rex Materials' premium joint and crack repair moldable. It was developed specifically to spread easily and finish smoothly for faster and better joint construction. E-Z Fill is formulated to securely bond between sections of Pyroform HP™, HP-45, PYROLITE® and other refractory segments. It has very good strength and abrasion resistance for long life. Pyroform E-Z Fill has the lowest thermal shrinkage of any comparable product, reducing the chance of joints opening and allowing metal penetration. Pyroform E-Z Fill is extremely non-wetting to molten aluminum, magnesium and zinc and when coated with Pyroform Sealer™, creates a surface that is truly impervious to metal attach and oxide attachment. Pyroform E-Z Fill is available in convenient caulking tubes, as well as one, and five gallons (3.8 and 18.9 liters) containers. It is caulkable and pumpable for large repairs or use as a back-up insulation material. Surfaces to be bonded must be clean and free of loose particles, dust and release coating. Curing takes place through normal air drying. Low temperature heat (up to 200°F or 95°C) can be used to accelerate the process, if necessary. This can be accomplished using a hot air blower or low velocity flame. Pyroform E-Z Fill is supplied with a freeze protectant to prevent damage during transportation. The product should be stored between 40°F (4°C) and 90°F (32°C). Under these conditions, the normal shelf life is one year. In temperature and humidity-controlled storage, a shelf life of one + years may be expected. specifically for shaping launders and other large parts, and for large repairs. It also works well for large cracks and joints. The material is easy to use because it flows smoothly and easily. It has high strength and holds its shape well while forming. E-Z Fill HD is non-wetting to aluminum and very abrasion resistant. Like its lower density counterpart, E-Z Fill, E-Z Fill HD has very low thermal shrinkage reducing the chance of metal penetration. 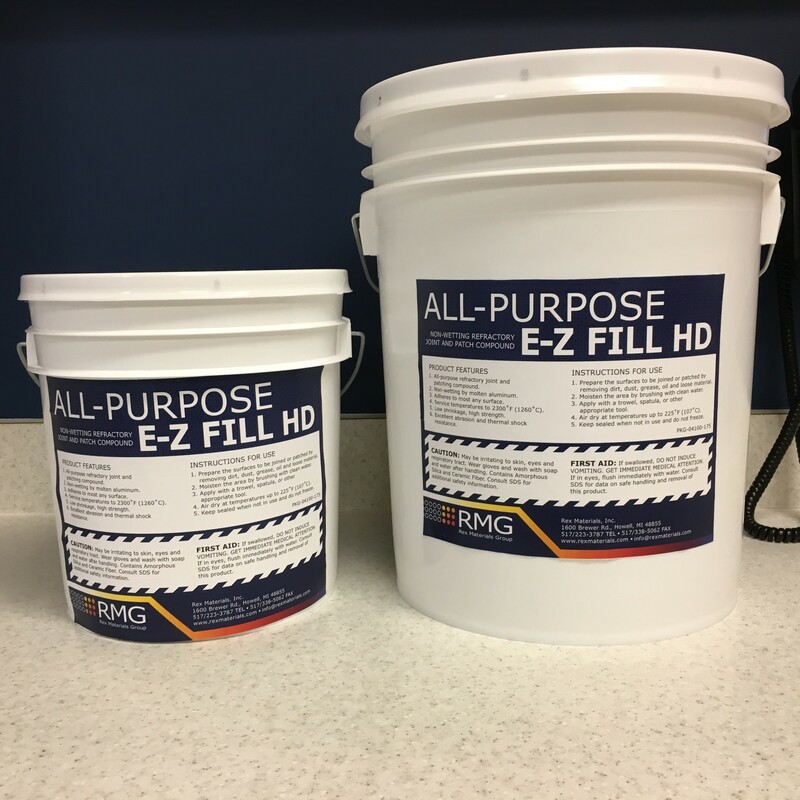 Pyroform E-Z Fill HD is available in one and five-gallon containers. It contains a freeze protectant to prevent damage during transportation. The product should be stored between 40°F (4°C) and 90°F (32°C). Under these conditions, the normal shelf life is one year. Weld expanded metal to inside of steel. Apply E-Z Fill HD to expand metal form by hand and with trowel to shape. Dry slowly with a hot air blower at 300°F (150°C) or less. Dry at 500°- 800°F (260°-425°C) to remove all moisture prior to use. Drying times will vary depending on the size and other factors. Pyroform Extender is an all-purpose high density refractory joint and patch moldable. Its low shrinkage, excellent thermal shock resistance, and good adherence make it suitable for many uses including larger cracks and build up repairs. Pyroform Refractory products can be patched or repaired with Pyroform Extender. Pieces can be joined together using Pyroform Extender as a cement. Pyroform Extender is available in one and five-gallon containers. Application. Surfaces to be bonded must be clean and free of loose particles, dust and release coating. Curing takes place through normal air drying. Low temperature heat (up to 200°F or 95°C) can be used to accelerate the process, if necessary. This can be accomplished using a hot air blower or low velocity flame. Apply with a trowel, putty knife, or caulking device. Pyroform Extender is packaged in airtight containers. It contains a freeze protectant to prevent damage during transportation. Pyroform Sealer is a surface preparation agent for Pyroform Refractory products. Pyroform Sealer is a high alumina product formulated specifically to assist in the resistance of molten aluminum attack. Its slightly dusty surface acts as a release layer to prevent adherence of molten aluminum. Application. Pyroform Sealer should be mixed thoroughly before each use (stir or shake). Surface to be coated must be clean and dry. Any application method which produces a uniformly thin coating, such as brushing, rolling, dipping or spraying may be used. NOTE: Heavy coatings may have a tendency to chip or flake. Coating must be dry before contact with molten metal. Pyroform Sealer achieves its highest strength and erosion resistance after service above 1200°F (650°C). Pyroform E-Z Pour™ is a pourable, granular material specifically designed for use as back-up insulation in irregular areas where conventional insulation materials (blankets and boards) cannot fit. Pyroform E-Z Pour is simple to install and requires no mixing, drying or curing. In fact, equipment can go into service immediately after the installation is complete. In addition, Pyroform E-Z Pour has a low thermal conductivity and excellent resistance to molten aluminum. These features make Pyroform E-Z Pour an ideal choice for casting tables, distribution launders and transfer launder systems. the Pyroform E-Z Pour to spill out. That's all there is to it - no mixing, no drying, no hassle. Removal of Pyroform E-Z Pour is just as easy. After removing the old refractory, simply sweep or vacuum the Pyroform E-Z Pour and you're done. Pyroform E-Z Pour is supplied in convenient five gallon containers which hold 22 lbs. (10kg) of material or economical bags that hold 60 lbs. (27 kg) of material. Each five gallon container is equipped with a handy pouring spout to make the installation even easier. An optional spout extension is available) for hard-to-reach areas. If alternate packaging is required, contact our Customer Service Team to discuss other options.